Easter Sundae m&m's dressed up for Halloween? I'm experiencing déjà vu. This isn't the first time we've seen a chocolate-vanilla m&m masquerading as something snazzier, and it likely won't be the last. Maybe I am completely off-base with my assumptions, but I'm going into this review with some pretty low expectations. Sadly, this bag has none of the fantastic functionality and photogenic qualities that Target's winter m&m flavor possesses, but the illustration is so cute that I'll let that slide. The black and purple bag features some subtle spectres in the background, which I love, and a spooked Red balancing a tower of cookies in the foreground. (Not unlike the stacks of cookies I make in every Oreo review ever.) It's pretty stinking cute, and I love the animated feeling of the scene. However, the stand-up bags are WAY easier to photograph and are resealable. Comparing this sack-like bag to that? This is like photographing a tiny glossy bag of potatoes, and while that normally isn't an issue, the nutritional information on the back has changed a bit and was an absolute NIGHTMARE to photograph. The info box is moved all the way to the top and even though it's in huge print, I find it harder to read. I wonder, why did Halloween get this while Christmas gets a fancy stand-up bag that's resealable? Halloween deserves more respect! 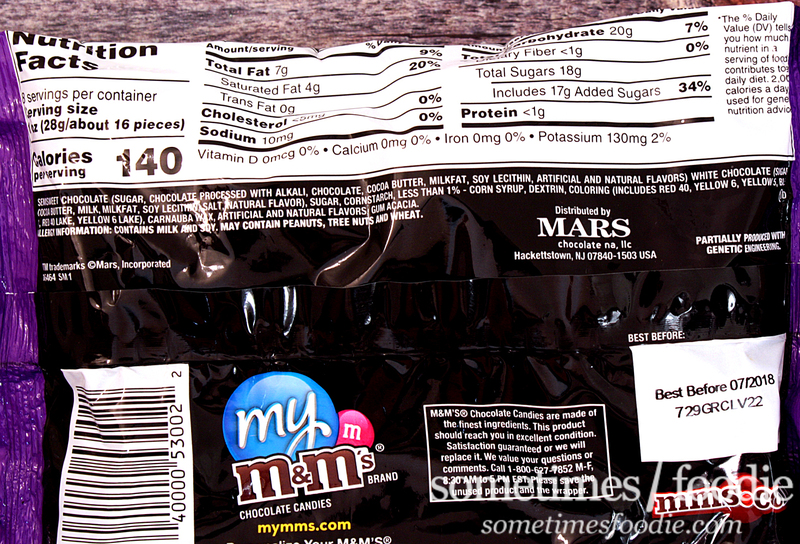 Once opened, the candy inside is a dark brown-black color with white specs. Some pieces are more speckled than others, and they have a dark, slightly tangy, chocolate aroma. 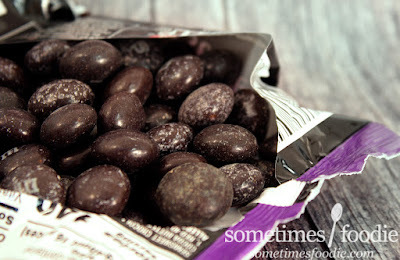 It reminds me of semi-sweet chocolate chips. I took a bite, and surprisingly they tasted richer than I expected, but I'm still underwhelmed. 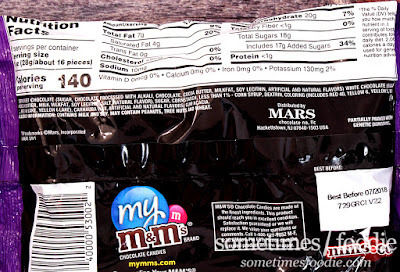 Underneath the candy shell is a layer of dark chocolate, which is quite sweet and fairly rich, kind of like brownie batter made with a box mix. 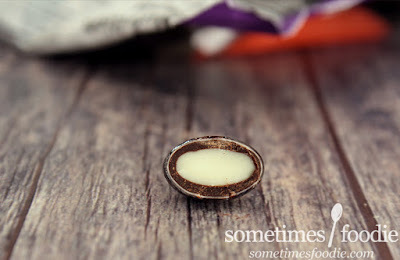 If you slowly let the candy melt in your mouth the outer chocolate layer melts away much faster than the core, leaving you with a silky chocolate texture that's really nice. Under that chocolate-y layer is a nugget of white confectionery that melts a bit more slowly and tastes like white chocolate. I feel like savoring it gives you the best eating experience. If you're a cruncher, these aren't as charming. If you pop these into your mouth and chew them up, you get more of a lack-luster canned frosting flavor that I'm not really a fan of. The aftertaste is more like the rich dark chocolate layer that I really like, but once that fades you get this cloying vanilla white chocolate taste (which would be the creme) and I just don't enjoy that as much. Unlike most of the general public, my least favorite part of cookies like Oreo is the creme. I vastly prefer the cookie, but I am in the minority. 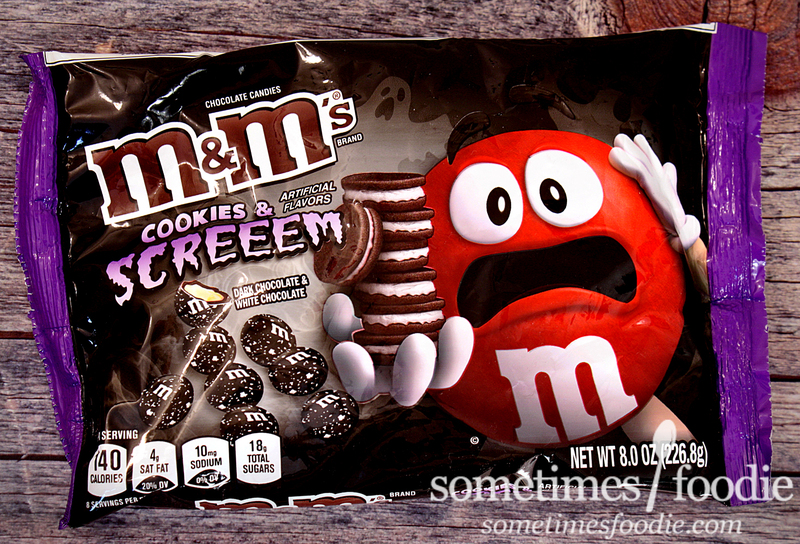 Don't get me wrong, I love cookies n creme ice cream, and Cookies n' Creme Hershey's bars, but this? I'm just lukewarm about. I don't hate them, but I'm not crazy about them either. The cloying sweetness of the white chocolate center really puts me off. Out of the two bags on m&m's in our household right now (these and the winter Brrr-ittle ones) my boyfriend and I prefer the coffee-like Brrr-ittle. His teenager daughter, on the other hand, prefers the Cookies & Screeem. So it's really all about preference. Everything I find too cloyingly sweet (like this cinnamon bun cheesecake) she loves, while me and my boyfriend are pretty "meh." That being said, she likes these, but she's not exactly crazy about them. I don't think this is a flavor you should run out and grab before it's gone, but they're better than you'd expect.